The euHeart project (2008-2012) combines seventeen industrial, clinical and academic partners, whose collective goal is the development of individualized, computer-based, human heart models. Using comprehensive, patient-specific data as the basis for their design, these models will provide insight into the origin and progression of specific disease patterns, including those associated with heart failure, heart rhythm disorders, coronary artery disease, and aortic disease. 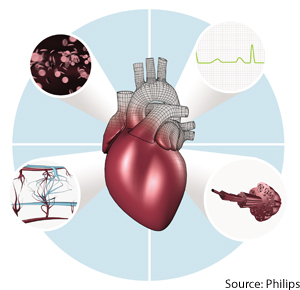 Along with these new computing tools, euHeart aims to highlight the benefits of multi-scale models for meaningfully improving clinical outcomes. Individualized models developed during the project will, consequently, be integrated into clinical contexts, to guide disease treatment and management - while data gained from the models’ construction will be used to optimize the medical tools employed for cardiovascular intervention. As partner within euHeart IBT is working on the creation and personalization of anatomical and electrophysiological atrial models. These models are aimed to be used for the evaluation and non-invasive planning of ablation therapy approaches. To personalize the electrophysiological models, IBT is also employing ECG imaging techniques based on non-invasive measurements. IBT created clinical workflows to use patient-specific biophysical models of the atria and torso for the planning and evaluation of radio-frequency ablation of atrial fibrillation. A rule-based method to incorporate myocardial fiber structure was developed and various methods to personalize electrophysiological models were established. A method to solve the inverse problem of ECG was applied to reconstruct the atrial excitation sequence from 64+ channel ECG data. M. W. Krueger et al. Personalization of Atrial Anatomy and Elelectophysiology as a Basis for Clinical Modeling of Radio-Frequency-Ablation of Atrial Fibrillation. IEEE Transactions on Medical Imaging, vol. 31, 2012. W. H. W. Schulze et al. Localization of the Atrial Excitation Origin by Reconstruction of Time-Integrated Transmembrane Voltages. Biomedizinische Technik / Biomedical Engineering, 55(s1), 2010. D. T. Rudolph et al. Reconstruction of atrial excitation conduction velocities and implementation into the inverse problem of electrocardiography. Biomedizinische Technik / Biomedical Engineering, 57(s1), 2012.